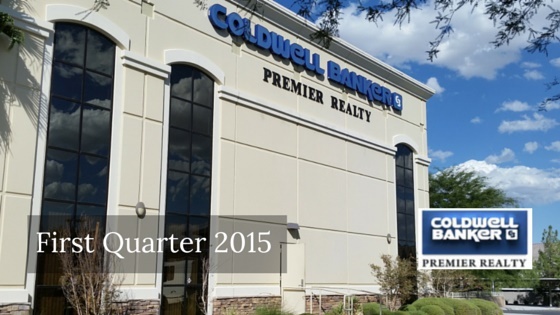 April 1, 2015 – Las Vegas, NV – Coldwell Banker Premier Realty’s (CBPR) 2015 first quarter sales saw an increase of 14 percent from last year’s first quarter. Additionally, CBPR and its staff were awarded a number of accolades throughout the first quarter of 2015. CBPR’s Corporate Services Division was awarded the “Platinum Award” by Cartus for its relocation services. Molly Hamrick, President, COO was honored as University of Nevada Las Vegas’ (UNLV) Marketing and International Business (formerly the Marketing Department) Alumnus of the Year. Tammy Pitts, Vice President of Operations for CBPR made Nevada Business Journal’s 40 under 40 list while Paula Burlison, Carole Crowder, GRI, CFAC, Kameron Kildea, Tina Mello, Dianne Varney and Loralee Wood were all named among Nevada’s Top Residential Realtors by Nevada Business Journal. Diane Varney was also awarded Top 25 Women In Real Estate by Nevada Business Journal. To top off the 1st quarter of the year, Devin Reiss, ABR, CRB, CRS, GRI, CBPR’s Senior Director of Career Development, was featured on the front page of the Nevada Real Estate Division’s monthly newsletter showcasing his appointment as one of only five Real Estate Commissioners. With the scheduled release of realistiQ’s real estate software along with an increase in agent training, CBPR projects it will continue to have a strong year. Coldwell Banker Premier Realty in Las Vegas, Nevada is ranked among the nation's leading real estate brokers in sales and innovation. CBPR is ranked among the top of all Coldwell Bankers nationwide. CBPR, acquired by Bob and Molly Hamrick in 1998, has three offices in Southern Nevada (Summerlin, Henderson and Centennial Hills) and presently employs over 200 agents. In addition, Bob Hamrick served as senior vice president and broker of City Center Realty Corporation and is recognized nationwide as an expert on the Las Vegas real estate community.